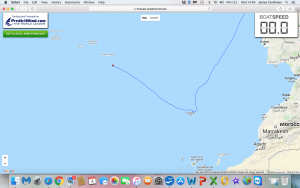 We left Porto Santo this morning 0700 and we are only 17 NM off the N Coast Madeira main island and as the crow flies 30 NM from the port of Porto Santo. It’s now 1800H. 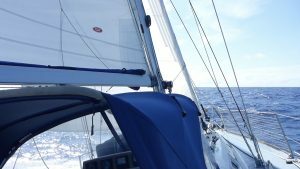 Lovely day with our sails being caressed by gentle northerly and north easterly winds though mostly with some east in them. If we’d left last night we would have eaten some miles by now. I knew the wind was starting to reduce about midnight last night and wanted to take advantage before that happened. It’s easy to get muddled in the lea of a high island with strong gravity fed winds descending in to the harbour. 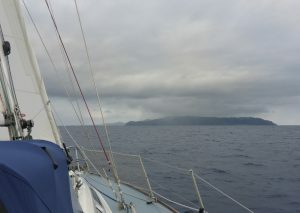 The other side, the windward side, was a pretty consistent 17 knots to get us away. I’ve come to the conclusion that once YOU have considered the situation, with your own experience, you should not listen too much to peer pressure. I did. In bright sunshine the sea is spectacular blue. And gun metal forbidding grey when overcast. 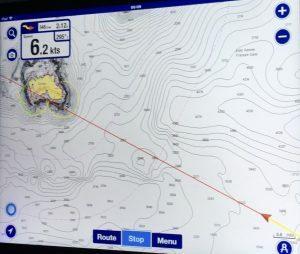 We have tacked trying to clear the western end of the main island and there is 1 knot of current against us at the moment. Having got down here with a following wind and current I was expecting the Azores current to be against us a little heading NW. There will of course be some local currents around the islands. We are not going to be making our 180 NM a day over the next few days. We are going to have to coax ourselves NW as the wind is supposed to veer and lighten more. So much more work to do. A tiny wind shift can stop us dead. I’ve seen little sea life. Not surprising from Al Coruna to Madeira. So hoping but not wishing for more than we want. Amorous whales stay away. ‘Talisker 1’ not at all keen to make a new friend. We will be well clear of the islands tonight. 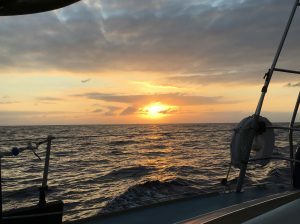 I suppose running engine for 8 hours total since 0715 yesterday morning ain’t too bad but it’s now 1825 underway 36 hours and we have 350 NM still to go. 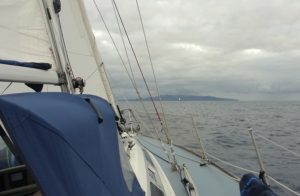 Been close hauled heading for Santa Maria since about 1600. Nice 4. Not a cloud in the sky. Blue blue water. Winds dropped slightly last ten minutes but still making way. We have a nasty bit of no wind to get through for about 12 to sixteen hours tomorrow before we get it again so motoring when necessary. I don’t think ‘Talisker 1’ understands being sedate. Anyway dear Commodore. All ok in the Atlantic at the moment. We have been underway exactly 24 hours. 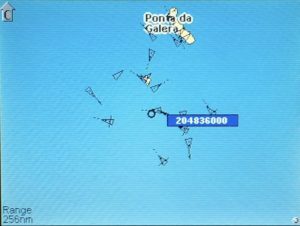 Porto Santo is 220 NM away. 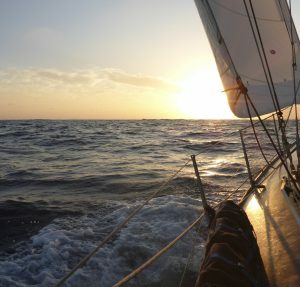 Ahead of us Santa Maria 277 NM . 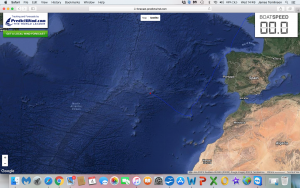 Nearest Portuguese mainland 580 NM Nearest bit of Africa about 570 NM. 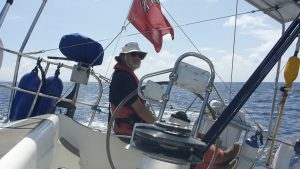 Bermuda over 2,200 NM due W.
‘Sentijn’ Taipan’ and ‘Tuesday’ ‘Sailing World’ please forgive me this. But for a Thames Estuary sailor who a few years ago regarded 40 NM from land as a major offshore passage these distances are quite big! 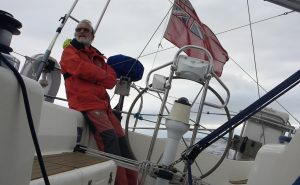 First 24 hours was quite slow but we’ve done slightly better in pretty light airs in the last 24 H.
Having charged through the night or rather since 1600 yesterday the wind died this morning. It’s not going to get better here until tomorrow morning but motor sailing for 12 hours today should have us sailing in NNE this evening. Wednesday morning there will be nothing and then it will be on the nose. So 12 hours of motoring seems the best option. Clear air like I’ve never seen! Visability incredible. We caught up with the wind at about 1600 this afternoon and we are now going well. 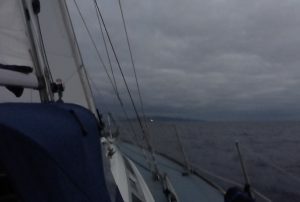 12-17 knots just in front of the beam. Catching up with some wind .. The wind was proceeded by a squall, clearly visible on radar! Even more so when we changed the setting on radar to ‘weather’. We skirted the squall to the west. Some rain and wind … now the skies are clear and ‘Talisker 1’ has lifted her skirts. We are being held in check by the Azores current though that could be running as much as 1 knot. This wind direction to a greater or lesser extent in strength should hold now until the early hours of Wednesday when we should, god willing, be closing on Santa Maria. 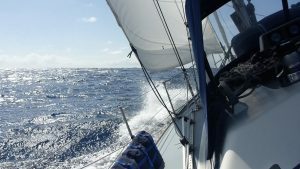 About 20 knots over the deck. ‘Talisker 1’ politely and then slightly more vigorously woke me up with a ‘put a reef in for goodness sake’. 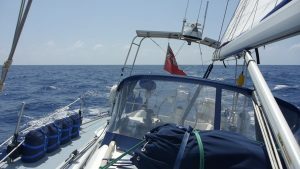 So Genoa furled, stay sail set, a reef in the main and I can make tea in comfort. My boat still grumbling about the tardiness but now comforting herself with still making 6.5 – 7.5 through the water. It’s my wonderful brother Henry’s birthday. The only minus is the sound of the engine giving the batteries a boost. And it’s still cloudy. 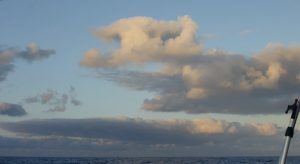 We dodged a pretty ghastly bit of cloud formation at sunset yesterday. Looked as though there was loads of evil under that as it scurried off West with her skirts dragging along the surface of the ocean. A bit of Harry Potter special effects department. 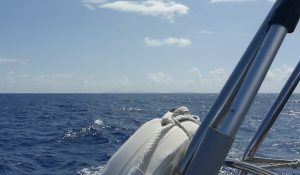 The Azores current is running about half a knot. 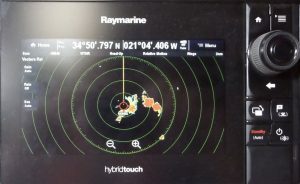 Us Thames Estuary Sailors are very interested and very much ruled by our currents! 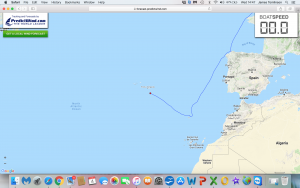 And for the first time since Porto Santo there is another vessel, the ‘Admore Cherokee’, a tanker, bound for Huelva, Spain. 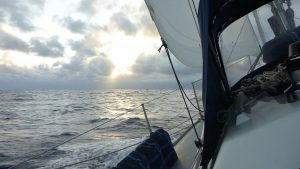 Passing behind us 8.5 NM away. I’m now making tea. 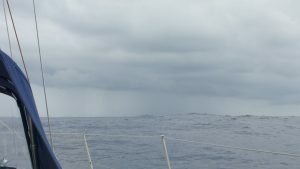 Hope to make landfall in about 24 H.
This leg is one of sloppy seas and multiple sail changes to keep going. 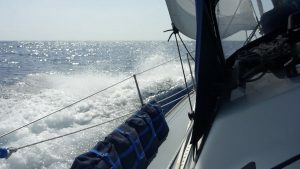 Just after midday lying asleep we were suddenly hard pressed with 25 + knots over the deck. In went a second reef and all was comfort again. 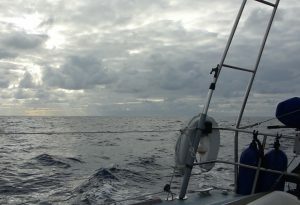 35 minutes later under 10 knots over the deck and out comes the second reef. 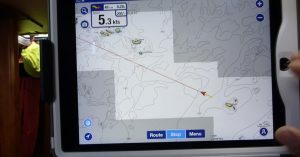 Sure enough we were back up to 17 knots so the 1st reef was perfect. 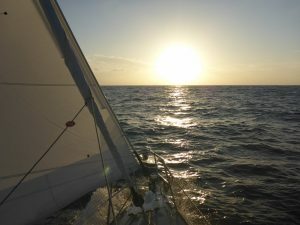 But then tiny wind shifts mean constant sail trimming. 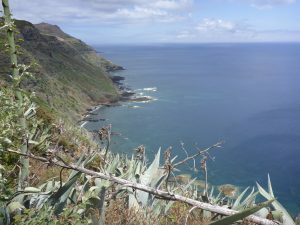 So a much more tiring three days than the very windy eleven hundred miles from Ushant to Madeira if you take away the 24 hours clearing Spain’s northern coast and TSS’s. 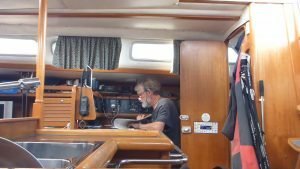 Once the boat was set up she needed little attention and I am now a lot less rude about her abilities downwind after that voyage south. We must be nearing land! I’ve just eaten the last tomato and apple. Bread down to two slices. Still! There is food for weeks on board but running low on the fresh. So nearing base camp. 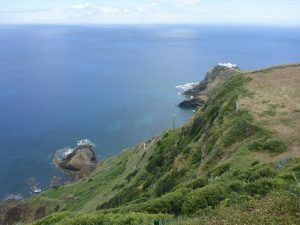 The Azores! My own little Everest to come. 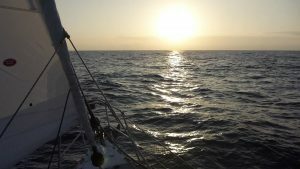 The sail to Falmouth from the Azores. But let’s get to the Azores first. Sorry about my wittering and thanks for reading. 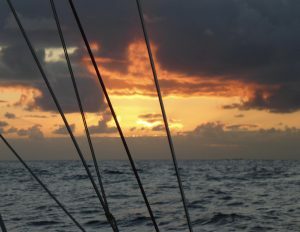 Sun setting on the 3rd ..
We are under 40 miles from Santa Maria. In ocean times we are arriving so no more sleep. We should be in harbour in about 8 hours. We’re making 7 to 7.5 through the water. So moving. The most startling thing out here is the air. The clarity. The cleanliness of the horizon, the clouds. There is not that pollution we always see closer to land masses. You ocean folk! Is that my imagination? Or am I right? There is a chill in the air! Cabin temperature down to 74F ….. oh alright 24C. Before you say I can’t do Maths, which I can’t! That’s what the temperature gauge says. 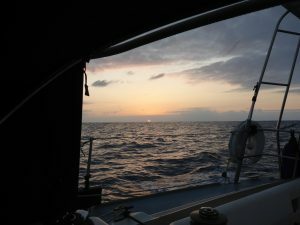 So the fourth night at sea on this leg. Our 24 H daily runs in the fickle winds have been down to the 130’s NM. 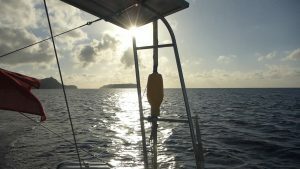 Although the 24 H run to midday yesterday was 141 NM. 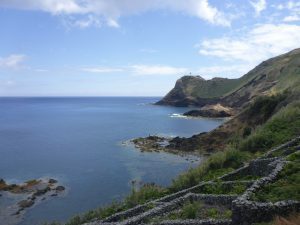 Santa Maria was the first island in the Azores colonised. The first thing settlers did was to cut down all the natural habitat. There is a history of great suspicion to visitors. 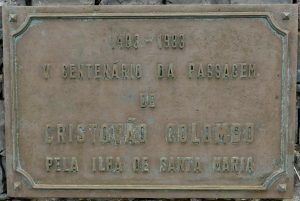 Christopher Columbus allowed half his crew ashore to attend mass and they were promptly arrested. It took all his diplomacy to get them released. I hope they will be kinder to us. I’ve just woken up in beautiful Santa Maria having arrived yesterday. This morning a blue sky and not a cloud to be seen anywhere. Your never far from home .. I wonder when she last saw Great Yarmouth? 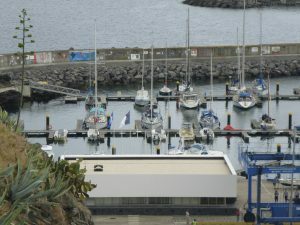 The current owner is from Uruguay ..
Vila do Porto Marina. 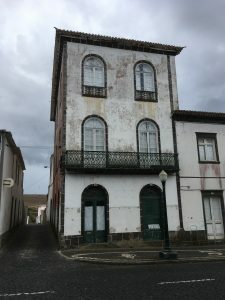 Reported to be the most sheltered in the Azores. The young HM Francisco has a wonderful sense of humour. “Is the island kind to visitors?” I asked, sitting in his office while checking in. “Of course” he said rather seriously. That made him laugh a lot! Not sure anyone has come up with that one for some time. He tells me that the younger generation leave for the mainland but a reasonable number eventually return to live. It was lovely getting here. The harbour is well protected and will only become a little uncomfortable in strong easterlies. 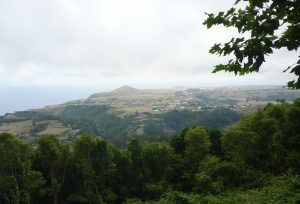 I’m told that quite a few of the harbours in the Azores offer poor shelter. An English couple, Mark and Carolyn Kenworth, were quick to say hello. 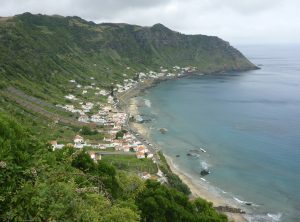 That was very nice as they had been told by Liisa and Shon in Porto Santo to expect me and ‘Talisker 1’. Sadly they left this morning but I had an hour with them yesterday on their very well organised and business like Westerly Storm ’57 Variety’. There are some nice Germans. One couple have been here a year fixing their boat up. 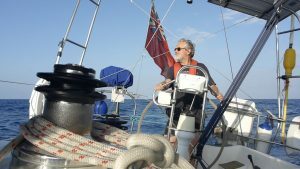 It had been cheap to buy having been half sunk in Porto Delgardo. It was relaunched yesterday. 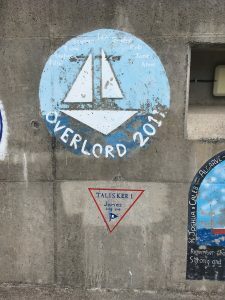 I sat with a group of them yesterday in the Naval YC. Good fun people. “Do you speak any German?” I was asked. I did the lines I spoke when I ‘acted’ in a German commercial many years ago which goes something like this ..
Well! The voice coach in London liked it before I flew to film in Munich. In those days it was the end of a career for a German actor to appear in TV commercials so they got us English actors to do the dirty work. We were delighted to take their loot. The German actors dubbed us afterwards of course. But our lips had to move reasonably in sink, hence having to learn the German lines. There was a beat of five. A look of complete astonishment! And then laughter, particularly from a very nubile German lady, part of the year long restoration job referred to above. Actually they were going to do the boat up in Lisbon but having set sail from here … he broke his arm. More of that later. This is a set up. Eventually I was filmed! “So that someone in Hamburg could research your voice” I was told “And tell us what it is your talking about”. There were a few muffled laughs behind hands. Right? I remembered the commercial involved three men returning from being out drinking, opening a freezer and uttering this line. I think we were supposed to be looking for a snack. I had been well paid so it must have gone out on air. Goodness knows which food stuff the commercial advertising. Munich was nice! I’m probably now on instagram, youtube and every other bit of nasty social media. A set up? Certainly. Anyway … the Germans were great fun. I was also warned that people never leave the island. It’s too nice. Ominous! 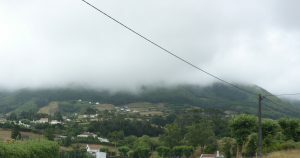 I’ve walked up the hill in to the village. It’s quite a busy place for a tiny island. The super market, well not really a super market, was heaving. 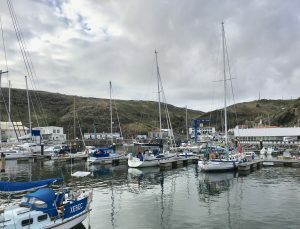 The harbour is very well equipped with a good boat yard and travel hoist. All immaculate with quite a few heavy duty boats laid up carefully and properly. The Portuguese are really nice people and seem genuinely pleased to see you. 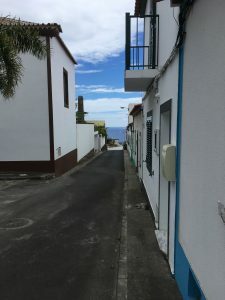 Checking in to the Azores was very simple. 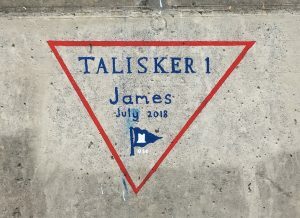 I only now have to produce the document I was handed to show at any other Azores island and the process will not have to be repeated as me and ‘Talisker 1’ are now officially here. You long distance sailors can explain. I’m UK SSR (Small Ships Register) so I have no home port on my paper work. 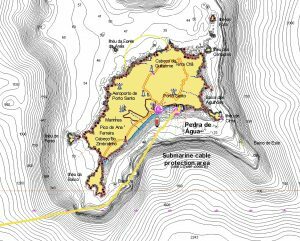 I’m asked for home port and I explain its not required for SSR. They seem happy to write Orford on their documents. It was interesting seeing the Santa Maria south eastern light house from so far away yesterday and suddenly to be surrounded by so many vessels. Using a Light House in anger is so rare these days. 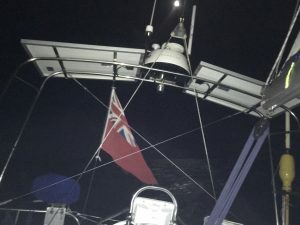 When I kip at night, I don’t just have the nav lights. Because I’m not standing at the helm I don’t dim the instrument lights. They are very bright indeed and it looks as though I’m fishing perhaps. A tip from Doc was to switch the deck light on too if there was a threat from traffic. The island was very overcast as it slowly grew larger. You can see it but your still have hours and hours before arrival. 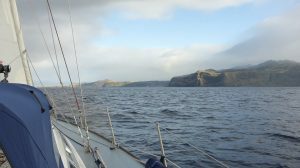 Eventually we were sailing down the south side looking up at the cliffs and cloud-covered peaks. Eventually the sea flattened in the lea of the land. 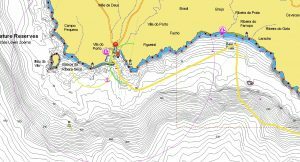 There is an anchorage before the main harbour of Vila do Porto. It’s the Baia da Praia Formosa with a lovely sandy beach. 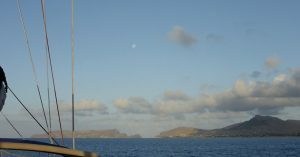 A yacht was at anchor and I thought it might be the Spanish single hander who I had briefly met in Porto Santo. For a moment I thought of anchoring but then decided a shower was a nicer idea. 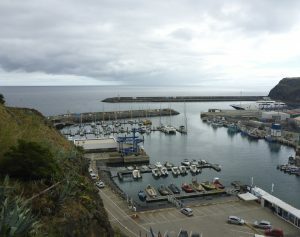 Half an hour later I was passing through the entrance in to the harbour to be met by Francisco and his colleague Isidro. The voyage was four days. It was hard work because of the constant wind shifts and strengths. So I had to work quite hard to keep us moving. There was a short time of motoring when there was no wind. 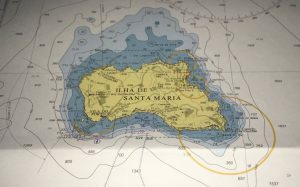 It seemed to take forever to leave Madeira as we were forced to sail west and had to beat down the north side of the main island of Madeira with current against us. 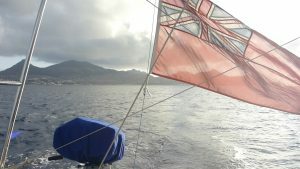 Slowly the wind veered until eventually we were able to make a direct heading for this island when about half way here. 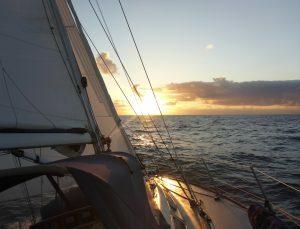 If I’d left later we would have had no wind for the last half of the trip so heading west was fine in the early part as our course slowly curved to the north. 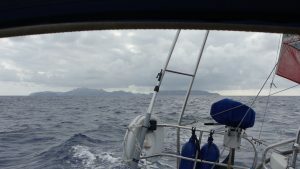 I thought we might be headed as we closed on Santa Maria so sailed as high as we could comfortably to make the last hundred miles or so easier. 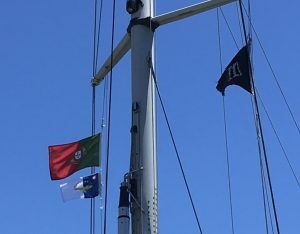 What a contrast to Biscay and then the sail south from Finistere to Madeira. 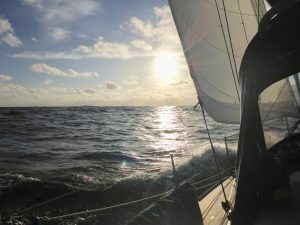 For those eleven days it was pretty much set the boat up and then watch, in awe, as we ran before the wind hardly touching the helm or trimming sails. And going back to my new friend who broke his arm. Concentrating for a few hours is one thing. Concentrating for a few days is something else. You can never let go of the ship. 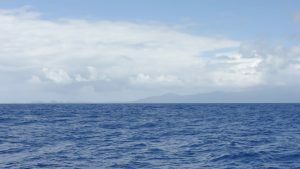 There was one moment when everything felt smooth and steady, I was not thinking and I must have momentarily let go of the ship as I moved across the cabin. The sudden lurch had me grabbing for hand holds that were no longer where they should have been. No harm was done on that occasion but it was a reminder of my responsibilities to stay fit. Injured, and the ship would be disabled. 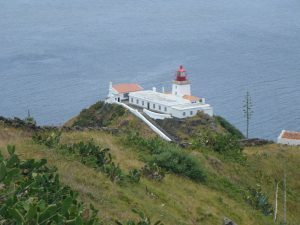 My German friend got back to Porto Santo because of his pretty partner. I’m alone and it would be a tad more difficult to say the least if the same happened to me. The sun is up. The kettle has just boiled again. I still have Yorkshire tea. I’m a very proud ‘half Barnsley’ (the absolute best half of me) boy and I’m almost certainly going to go see this island. And I’m proud of my roots and not of my sailing. 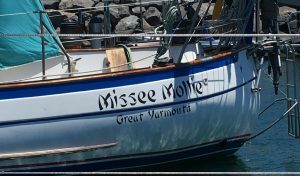 There is a very business like German SV ‘Piccolina’, a Halberg Rassy 41 in the marina. A lovely couple Steffi and Rolf. They are heading in much the same direction as wonderful ‘Sentijn’ (John, Kara and Dean) and ‘Taipan’ (David and Kris). Contact information has been exchanged. Cape Verde for late November early December. 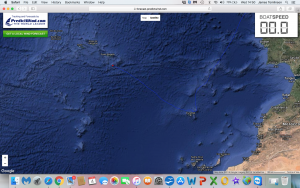 An Atlantic crossing and then at some point next year entering the Pacific Ocean. I had a guided tour of the island today without too much expectation. 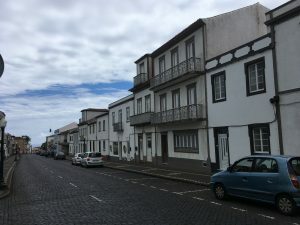 For cruisers heading this way Pedro is the v v nice guide +351 918 941 946 ilhadosoltours@sapo.pt otherwise the harbour office will contact Pedro for you. It’s worth every penny of the 30 Euros a head and it was a generous 10AM – 5PM. The island is quite complicated and large. 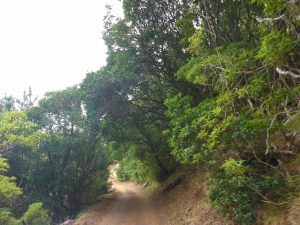 The trekking trails are wonderful. I’m blown away by the place with its microclimates and stunning scenery. Because of how special the place is there is a fair degree of keeping the place quiet. It’s paradise for Geology, Palaeontology, diving, whale watching etc. 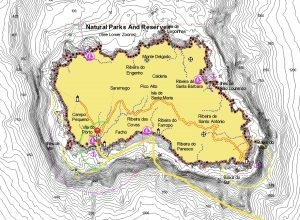 It’s the only island in the chain having sedimentary rock. One moment we were driving in arid desert and the next entering a rain forest before then descending to a deserted sandy beach. 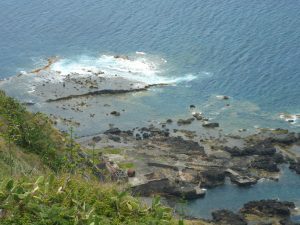 Then we were walking paths high above the ocean and looking up to 100 metre waterfalls. My pictures are not going to do this place justice anyway. 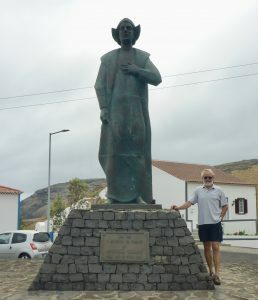 It was nice to find a statue of Christopher Columbus in Baia dos Anjos. Somehow the cruising fraternity seems to miss this island. It’s got a well protected harbour with generous pontoons and long fingers. There is a definite wanting to guard the islands natural treasures confirmed when I spoke to Antonio in the fossil museum. Antonio is early 30’s and a born islander just returned from several years working as a lawyer in Boston USA. I’m out of the rat race, he told me. I dive every day. People are not rude to each other here. Ever! Antonio was as enthusiastic about his home as Pedro. Pedro wanted to see the reaction when we turned a corner in the road to reveal yet another wonderful scene. “How do you feel when you wake up every morning?” I asked him. “Wonderful” he replied. “I have this to look forward to just about every day throughout the summer months. Showing people one of the most beautiful places in the world”. There are two international flights from Lisbon every week so I’ll be back with my Sally. 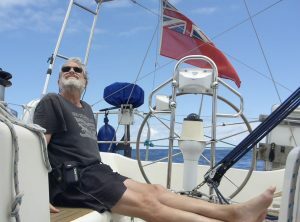 I’m not going to really enjoy myself here knowing I have a long sail ahead of me. I’m quite preoccupied with that. Last night. 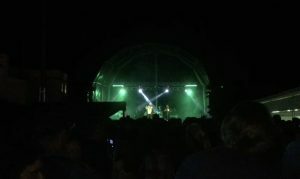 A folk festival in Maia.